Last week, we celebrated the launch of Rocket Science; an educational project sending salad seeds to space and back. Give your local school the opportunity to grow these 'space seeds' in a national science experiment. 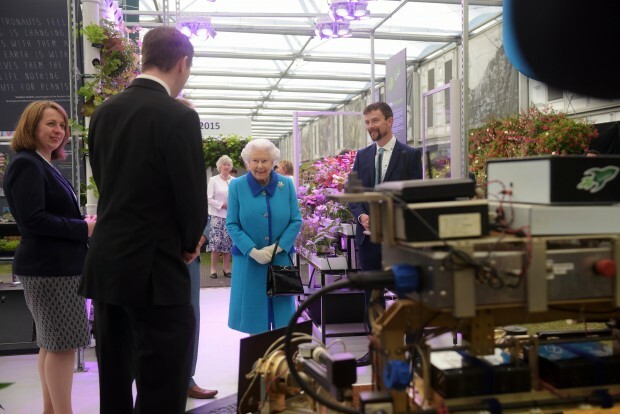 HM Queen Elizabeth II visits Rocket Science exhibit at Chelsea. Credit RHS. Run by ourselves and the RHS Campaign for School Gardening, the project was unveiled at the Chelsea Flower Show where over 3000 UK schools have already registered their interest. Our exhibit demonstrated the importance of plants in space. On Earth, 30 crops provide 95% of human food energy needs. 4 of these (rice, wheat, maize and potato) are responsible for more than 60% of our energy intake. Our exhibit showed 10 food plants that scientists working on the MELiSSA closed life support system have identified for future research and food production in space. If they can be successfully grown, astronaut dining will be changed forever. Does space travel affect the growth of seeds? This innovative educational project will involve 2kg of rocket seeds being sent to the International Space Station as part of British ESA astronaut Tim Peake’s six-month Principia mission. After several months on board, the seeds will be returned to Earth and sent to thousands of UK schools, alongside a batch of that have stayed on Earth. Pupils across the country will have the opportunity to grow and compare these seeds to see whether we can sustain human life in space through the production of our own food. Register your interest through the RHS Campaign for School Gardening website. Thank you to everyone who took part - especially the team at RHS for counting 5,279 votes! For email updates on Tim's mission, sign up to our Principia newsletter and follow Tim on Twitter. For space sector news, you can find us on Twitter and Facebook.